He was once so frightened and unmanageable that no one could get on him as a young horse. 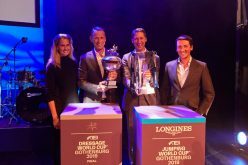 But in the hands of one of the most celebrated equestrian athletes of all time, the 11-year-old gelding Emilio gave Germany’s Isabell Werth her fifth victory in the FEI World Cup™ Dressage 2017 Western European League qualifier at Gothenburg in Sweden today. 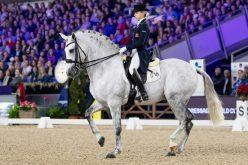 Her score of 84.200 put her well ahead of Swedish runners-up Patrik Kittel and Delaunay (80.910) while, mirroring the results of yesterday’s Grand Prix, Germany’s Jessica von Bredow-Werndl and Unee BB (80.845) slotted into third. Werth (47) only had a two-day turnaround after winning the previous leg of the series with Don Johnson at Neumunster (GER) last weekend. 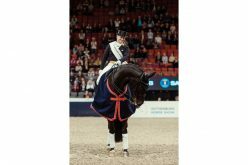 “So I asked my rider at home to prepare Emilio in the right way – and I think she did that!” she said after her Grand Prix success. Today however she said the horse lost a bit of confidence in the Freestyle. 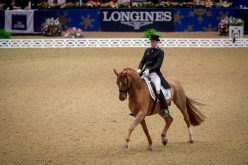 “I realise now that he needs more training because he didn’t always know what to do and we had two mistakes, in the pirouette and tempi changes”, she explained. However that has just inspired her ahead of the last qualifying leg in ’s-Hertogenbosch (NED) where she will again compete Emilio in two weeks’ time. “I’m really excited about going there now” said Werth who holds an unassailable lead at the top of the league table. 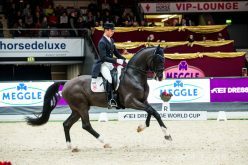 Her preferred ride for the FEI World Cup™ Dressage Final in Omaha, Nebraska (USA) next month is her Olympic mare Weihegold, but she now considers Emilio a strong reserve. Werth’s perseverance with this horse is really paying off – “he has great potential, already his piaffe and passage are fantastic!” she said today. Talking about the erratic behaviour that left Emilio with something of a reputation in his early years, she explained, “it was as if he could see something out of the corner of his eye when you tried to get in the saddle, he was terrified and would go crazy.” There seemed no future for a horse with such a dangerous and debilitating level of inexplicable fear. “He nearly went to heaven”, Werth said of the gelding for whom she now has very high hopes. “Emilio was lucky to come to Isabell, not all horses find the right people!” said Kittel (40) who was thrilled with his result with the ever-improving Delaunay today. The Swedish star has now moved up to ninth place on the league table from which the top nine will qualify for the Final. He won’t be travelling however, “it was never in my plan” he said today, but von Bredow-Werndl (31), who holds sixth place, certainly will. She has the next few months carefully mapped out. “I will go to Omaha, then do two more shows and then I take a break” said the rider whose is expecting her first baby in August. Result: 1, Emilio (Isabell Werth) GER 84.200; 2, Delaunay (Patrik Kittel) SWE 80.910; 3, Unee BB (Jessica von Bredow-Werndl) GER 80.845; 4, D’Agostino FRH (Fabienne Lutkemeier) GER 77.720; 5, Di Lapponia T (Paulinda Friberg) SWE 76.750; 6, Thriller (Katja Gevers) NED 73.630; 7, Rustique (Mai Tofte Olesen) DEN 72.805; 8, Languedoc (Kristian von Krusentierna) 70.415; 9, Charmeur (Malin Rinne) SWE 70.030; Edvin (Per Duvefelt) SWE 66.185; 11, Catch Me (Margo Timmermans) NED 62.665. 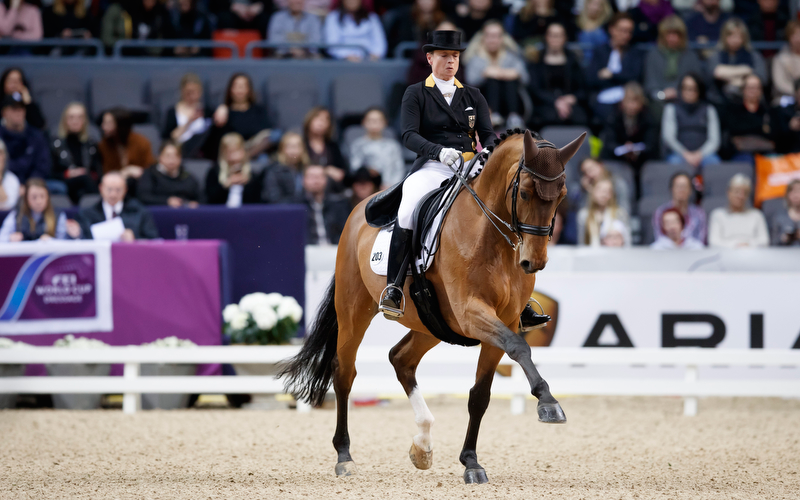 Gothenburg Horse Show (SWE) hosted the 8th leg of the FEI World Cup™ Dressage 2016/2017 Western European League today. The last leg of this qualifying series will take place in ’s’Hertogenbosch (NED) on Saturday 11 March. 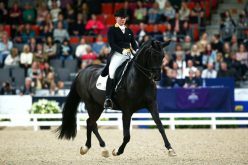 The FEI World Cup™ Dressage 2016/2017 Final will be held in Omaha, Nebraska (USA) 27 March to 2 April. 11 horse-and-rider combinations from 4 countries competed today. The panel of judges consisted of: At E, Guislain Forage; At E, Leif Tornblad (DEN); AT H, Vincenzo Truppa (ITA); At C, Annette Fransen Iacobaeus (SWE); At M, Gotthilf Riexinger (GER); At B, Lars Andersson) SWE. Germany’s Isabell Werth scored her fifth win of the season when coming out on top with Emilio. 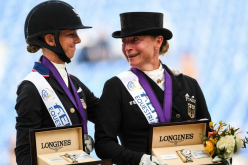 The multi-medalled German Olympian has competed at 15 previous FEI World Cup™ Dressage Finals, posting her first win in Gothenburg in 1992 riding Fabienne and her second victory in Las Vegas in 2007 riding Warum Nicht FRH. 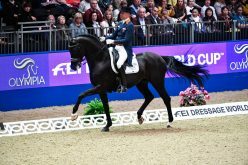 The top nine riders from the Western European League will qualify for the FEI World Cup™ Dressage 2017 Final.